First paint any electrode configuration you wish onto the special conductive paper with silver paint. Then connect the electrodes to the supplied battery holder. The battery sets up a current in the paper which generates voltages at all points on the paper. You measure these voltages at many points using a multimeter and a metal probe to touch the paper where you want to measure. On a separate sheet of paper, you record the voltage locations. 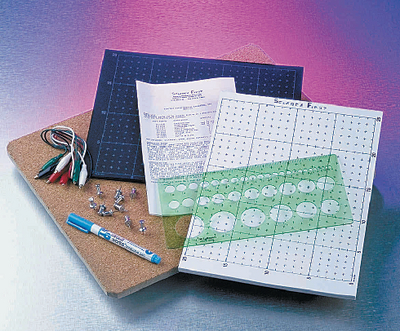 This kit includes cork-covered base, 30cm x 26cm; pad of 25 sheets pre-printed conductive paper 28cm x 21.5cm; pad of 100 sheets pre-printed paper for drawing fields; nine metal-headed push pins; a silver conductive pen; four alligator clip leads; circle template and instruction sheet. Requires D-Size Battery and Battery Holder or DC Power Supply, and a Multimeter (sold separately).